I met Savio while I worked in P&T’s Téléboutique in Luxembourg city – my summer job for the last couple of years. I think he saw the slideshow from Martine and Mike’s wedding and showed them to Julie. They asked if I could take photos at their wedding, and once my schedule for my MA last summer had taken shape I could confirm that I’d be able to cover one last wedding during my time as a student – theirs. Once more I asked Olivier to help me out as assistant and second shooter, and he did a great job. We started the day at Julie’s parents’ in Thionville. From there it was but a short drive to the lovely neo-apostolic church where they got married. This was the first non-catholic wedding that I’ve covered so I checked with the priest to make sure I’d be aware of the differences. After the moving service, a limousine picked up the newly-weds. We drove to Mondorf-les-Bains: the reception and the dinner were held at the Orangerie in the park. Having everything in one place like that made logistics a bit easier and meant that we could spend a bit more time for the couple photos. In terms of lighting, I made use of the technique I first tried at the Southlands Beach Fashion Shoot, namely pushing three Speedlights to full power, and using the PocketWizards to sync at 1/500,double the 5DMkII sync speed. That way I got enough light to work in bright daylight (we had wonderful weather) without being at the sun’s mercy. The PocketWizards also came in handy for one of my favourite photos from the shoot (the one next to the river), where I was about 40 metres away from Savio and Julie, and the PWs together with the 3 flashes gave me both enough working distance (for composition) and brightness from the softbox which was about 4 metres away from them. During the evening I gave Olivier one of the transceivers so that we could both trigger the flashes that we had set up in the Orangerie to support the ambient light. The reception and dinner were very entertaining. 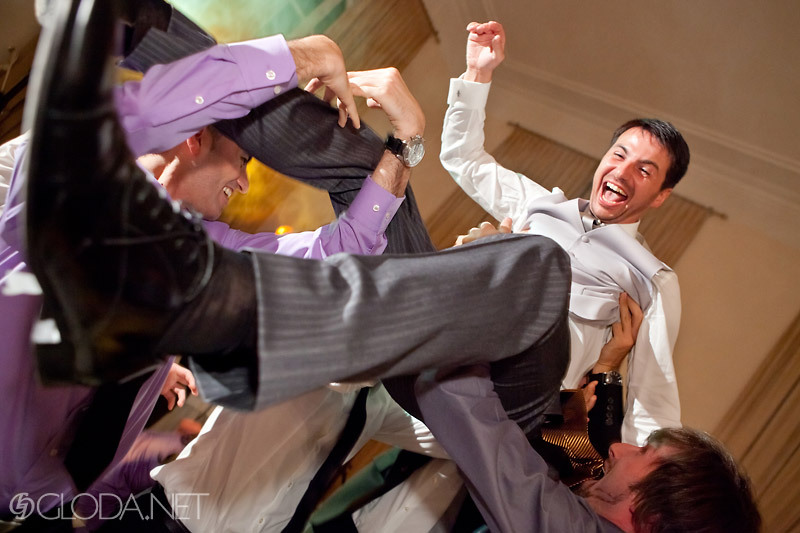 I’m glad that I was at the right place at the right time when Savio’s friends spontaneously decided to lift him off the ground :) During the dances I used a technique I learned from David Ziser: get one slaved flash behind the couple to create both a nice rim and some cool lighting on the floor. Olivier had to put some effort into that, since he had to be in the frame without showing up on the pictures. I had a really great time at the wedding, and I hope I captured the ambience in the photographs! That was probably the last wedding I’ll cover. My time as a student is up and I’m moving on. Jacky and Steve’s wedding in September was the last one I covered in 2009, and oh boy, it was great to be there. Alison had come down to be my assistant for the day. We started the day with the couple shooting in the park in Colmar-Berg. 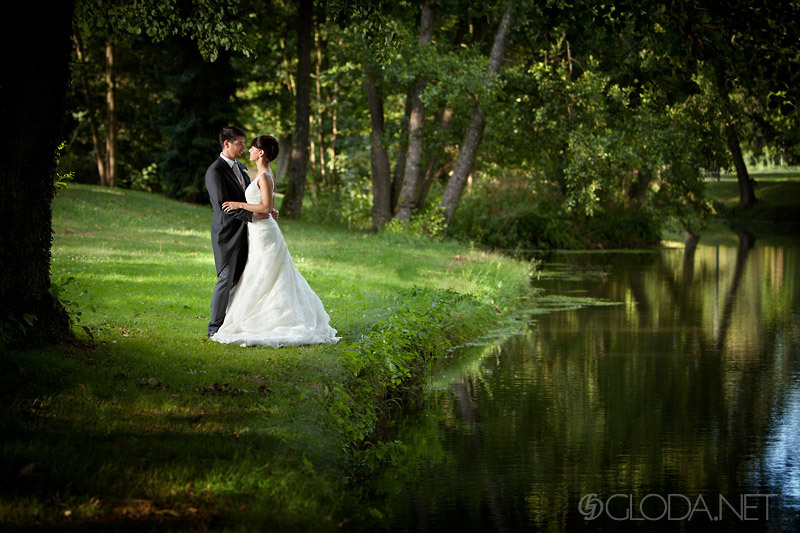 It offers some gorgeous backdrops all along the shores of its lakes. On the technical side, I finally got to make proper use of the PocketWizards’ full potential. Their high sync-speed capabilities made it easier to balance the flashes against the full daylight and generally made using the lights more practical. The shoot in the park was a lot of fun, and the atmosphere just carried on right through the rest of the day. The ceremony was in the town hall in Vichten. Their ceremonial room upstairs was very interesting in terms of lighting, the mix of indirect sunlight from the windows and artificial light sounded like it was going to be tricky, but it turned out to make for some great sidelight and colour contrast which gave the whole ceremony a very warm character. The reception and dinner were back in Colmar-Berg. We had already briefly visited the area for some architectural elements in the couple shoot. The dinner hall was nice because it offered such an open space and a lot of room for the dance floor. I actually asked Alison to film Jacky and Steve’s first dance with her 5DMkII while I was taking photographs. I think the short clip makes for a nice moment in the slideshow. The evening was marked by some crazy games for the newlyweds and their guests and an all-round festive mood – definitely an awesome evening for a very cute couple. Such a cute couple. I had a great time at Lynn and Tim’s wedding last summer. Tim used to work with my aunt and that’s how we got in touch. As usual I went to see them and we discussed the details of their wedding well ahead of time, so that everything could go as smoothly as possible on their big day. Once again, Olivier Kerschen assisted me throughout the day. It’s great to have an assistant with you who knows the way you work. We started the day at Lynn and Tim’s home with detail photos and some shots of Lynn getting ready. The church in Obercorn in which the ceremony was held wasn’t far from their home, so we could spend a good deal of time with Lynn and still meet Tim at the church, early enough to confirm with the priest the decisions Olivier and I had made when we had scouted the church on an earlier occasion. The ceremony was great, with some brilliant solo performances by the choire and lots of emotions. The reception and dinner were at the Claimarais in Belgium, a lovely hotel-restaurant with a beautiful parc surrounding it. We stayed with the couple and their guests well into the night: the dinner was followed by catchy music by an Italian trio, and the family and friends had come up with some priceless games for the couple in between the dances. We took the couple photos of Lynn and Tim on a separate day, which allowed us to visit a couple of locations. We started in the Grund in Luxembourg city, which looks great in summer; then we moved on to the Schueberfouer, the yearly Luxembourgian funfair for some photos in a more unusual and exciting setting. Finally we drove to an abandoned warehouse to finish the shooting with a modern, gritty edge. What an awesome wedding. Kirstin and Christophe made sure that their guests would have a marvellous time, and the great atmosphere made being their photographer a great experience. Christophe is a user on photogen.lu, where he and Kirstin had seen some of my work. In fact quite a few members of that community were present at this wedding, apart from myself and Christophe, there were his brother-in-law Alain and of course Olivier, who assisted me throughout the day. We arrived at the church well ahead of the couple to give us a bit of time to reevaluate the positions from which we’d photograph – children from the church communion had built a symbolic space rocket which remained set up between the altar and the congregation. It turned out not to be a problem though, the Belair church is fairly spacious. The ceremony was one of the most beautiful and entertaining ones I’ve witnessed this summer. Both the bride and groom are members of church choirs and they’ve been friends for a long time with the priest that ministered. After the ceremony Christophe was made to showcase his talent with the accordeon and Kirstin hers as conductor. Quite a fun interlude! After Kirstin and Christophe had shaken hands with all the guests at the reception we drove to the communal park in Hesperange that I had already visited with them beforehand, to shoot their couple photographs. The weather played along nicely, a slightly overcast sky makes it easier to balance artificial and ambient light. Like before, it was Olivier’s job to make sure the light was held in position just where I needed it. The dinner was in a lovely restaurant near Altwies, called Le Moulin. We took the group and guest photos outside the restaurant in front of the picturesque brook before moving inside the luxuriously decorated converted mill to cover the dinner, games and emotions for the rest of the evening.